Some things just make me laugh and watching Jenna with her most recent "best friend" is one of those things. 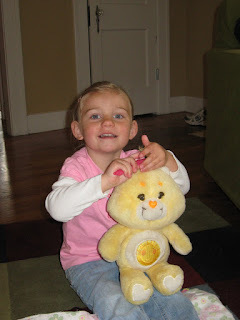 Funshine Bear is a Care Bear, to be precise this is Aunt Nae's Care Bear from when she was little. Jenna found this while playing at Gram's a couple weeks ago and it seriously goes everywhere and does everything with her. While sometimes annoying to drag the bear along, it is so sweet and cute to watch her with this bear. 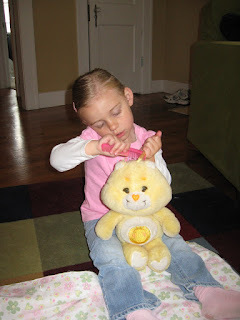 We'll often hear "oh buddy" or "oh honey pie"...yes she is talking to Care Bear. If we refer to Bear as "she" or "her" we are quickly corrected "he is a boy, not a girl". She feeds him a bottle and even has smuggled a newborn size diaper or two from Allee's diaper bag to use on him. When we go in the car so does Care Bear...he even has to wear a seat belt for as Jenna would say "mommy says we have to be buckled in the car so sit like a good boy". I drew the line at Target yesterday when she said Care Bear needed to use the potty. I simply wasn't willing to take it that far so I told her that Bear wasn't potty trained yet and could use his diaper, she just looked at me and said "oh yeah, that's right I forgot". What's so cute (and sometimes not I guess) is that she often reflects my "mommy-ing" to her bear. For instance, yesterday I told her to sit still while I put a ponytail in her hair. Within 10 minutes she was getting a comb and clippy and was sitting on the floor to do his hair (he's a boy with bows in his hair...hmmmm) anyway, I stand back and let her play and soon I hear "buddy you need to sit still so I can get this in your hair"....she gets it clipped and I hear "there, all beautiful". At one point I had to get after Jenna for not listening, just a verbal warning with the threat of a time out if it happened again. Once again within an hour I hear "honey pie, if you're not going to listen then you will have to go in time out because that's not being very nice". I'm just amazed every day at her and the things she does....and now a little more aware of what I do since it's being mimicked ALL the time! It's good practice for being a great cousin to Allee and it's made me frighteningly aware of how fast she is growing up!!! Here's a pic of Jenna doing hair.